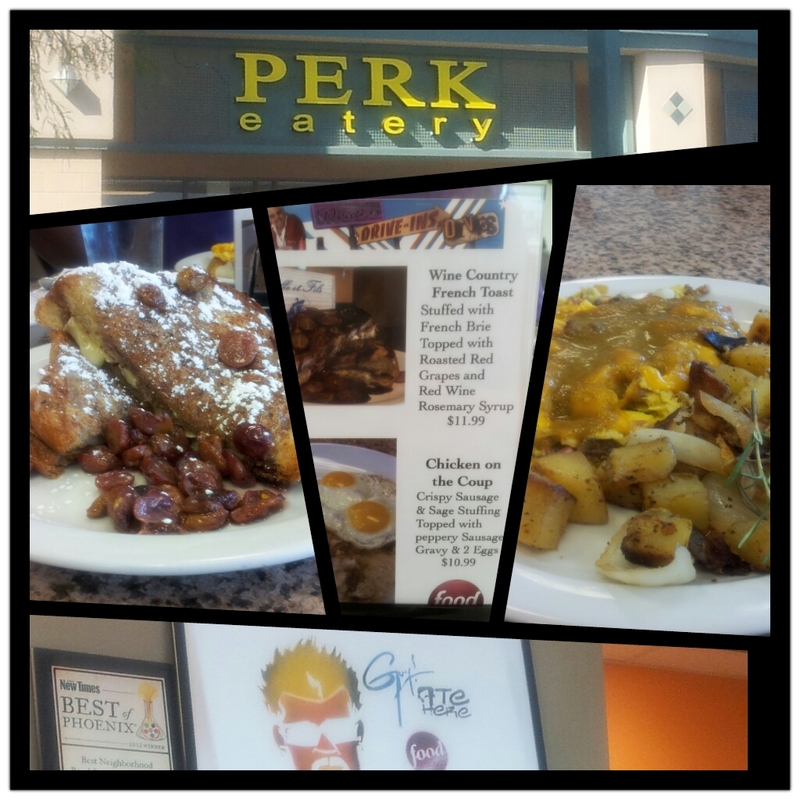 Perk Eatery, 6501 E Greenway Pkwy, #159, Scottsdale, AZ. Up early with the sun in the beautiful desert oasis of dreamy Scottsdale, I wanted an inventive, hearty, and flavorful breakfast to start my busy day. One glance at Perk Eatery’s menu and I set my GPS to quickest route. On their Special-of-the-Day board, I hit the jackpot with their Wine Country French Toast. Thick pieces of French toast stuffed with brie cheese, topped with roasted red grapes and red wine rosemary syrup. Jealous?! Ha! Beautiful beautiful breakfast dish. Perfect with my fresh hot coffee. Me being me, I did toss on a tad of maple syrup…I like it gooey loaded 😉 That was a special treat I hope to have once again. While there I had to taste test an egg dish. In keeping with the theme of being in the Southwest, desert, cowboys, bad boys, I was intrigued by the ingredients of The Outlaw Scramble…get a load of this. Three eggs, chopped ham, bacon, sausage, sautéed onions, green peppers all smothered with cheddar cheese and topped with cilantro jalapeno sauce. OMG. Hefty but dang, the flavors were incredible edible and not too fiery spicy. I’m a sauce lover and the cilantro jalapeno that topped this magnificent mega meal was one I couldn’t get enough of. Deeeee-licious! Fab menu for breakfast and lunch. Can’t go wrong here, using as much fresh, local and organic foods as possible. As seen on Guy Fieri’s Food Network show, Diner’s, Drive-In’s and Dives. In a nice shopping center with free lot parking. Yay! Hours: 6:30am-3pm daily. 4.5 out of lipmaking points.